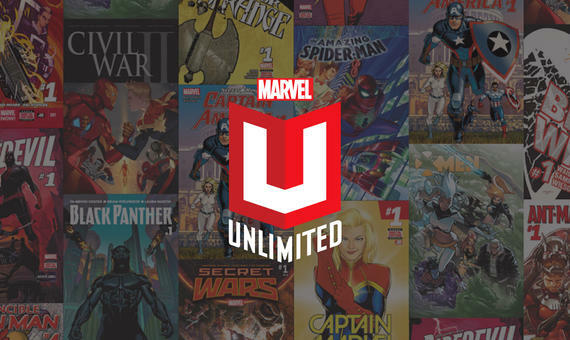 John Proudstar served as a United States Marine and then went on to fight for his fellow mutants thanks to the X-Men. John Proudstar AKA Thunderbird was a courageous mutant forever determined to honor his Apache ancestors with feats of heroism. Sadly though, Thunderbird is notable among the X-Men for his tragically early death, which occurs during what was only his second mission with the team. John Proudstar grew up on the Apache tribe in Camp Verde, Arizona. 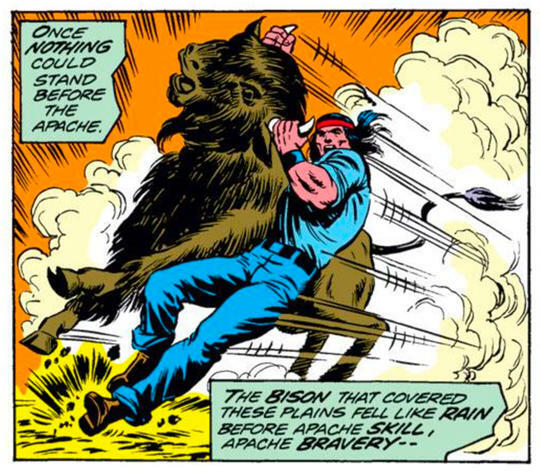 His mutant powers manifested at a most opportune moment, when he stopped a bison that was charging at a young girl. John discovered that he had superior strength and endurance—abilities that allowed him to lift massive amounts of weight and run great distances at an amazing speed. After gaining notoriety on his reservation due to saving the girl, John decided he didn’t want to stay idle and, lying about his age, enlisted in the US Marines for a two-year tour of duty. There John, who was an outcast and loner during his formative years, found a sense of purpose and a camaraderie with his follow soldiers. Attaining the rank of corporal, John earned a number of medals, including one for rescuing a helicopter pilot downed in the Caribbean Sea by lightning while traveling to Guantanamo. It was during this mission that John witnessed what he believed to be his totem: a great bird of lightning in the sky. Once John returned home from his tours, he found himself restless and withdrawn, depressed and bored due to not using his mutant abilities for good. It wasn’t long though before he found himself approached by Professor Charles Xavier —who’d offer the reluctant-to-join John a spot in a new version of the X-Men. It’s there that John would take on the code name Thunderbird, based on the vision he saw in the stormy Caribbean sky. On top of being a skilled hunter, tracker, and fighter (in both hand-to-hand and small arms combat), Thunderbird’s muscle tissue is three times as dense as that of a normal human’s, distributed in such a way as to give him massive shoulders, arms, and thighs. Thunderbird can exert himself at peak capacity for several hours before fatigue begins to affect him. His skin is also extremely dense, including an additional layer of leathery epidermis, affording him heightened injury resistance. In addition, his lungs are oversized and his respiratory system is superhumanly efficient, allowing him to hold his breath for extended periods. Thunderbird didn’t have enough super-powered adventures to build up a tried and true enemies list, but a mutant, Dr. Edwin Martynec, who performed illegal radiation experiments on his mother probably stands as his most personal feud. Martynec escaped capture however, as did Count Nefaria—the villain who Thunderbird died trying to apprehend. 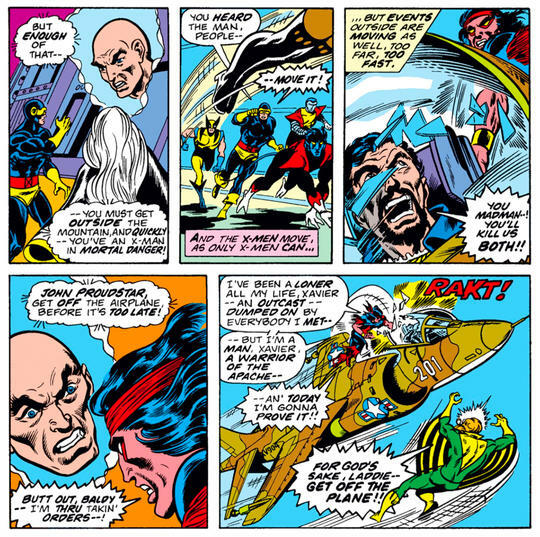 While not his enemies, Thunderbird also had notable friction with X-Men teammates Cyclops and Iceman, who were put off by his abrasiveness and argumentative manner. Thunderbird doesn’t make friends easily and was even apprehensive to take Charles Xavier up on his offer to join the X-Men. Aside from his time with the Marines however, being a part of the X-Men, as brief as it was, gave Thunderbird a sense of community and family that he shunned somewhat growing up as a reserved outcast. That being said though, Thunderbird didn’t truly gel with the X-Men as they first worked together, with his volatile and ill-mannered behavior often throwing the team off balance. Even his death came about because he directly disobeyed his teammates’ requests. After Thunderbird returned home from his U.S. Marine tours overseas, he’d often, succumbing to boredom, spend his time wrestling buffalo to the ground. After learning that his mother was diagnosed with chronic lymphocytic leukemia, John and a reporter friend named Michael Whitecloud took it upon themselves to investigate her doctor, Edwin Martynec. It turned out that Martynec, a mutant who could transform into a hybrid coyote creature, was performing illegal experiments on people as part of his research into genetic enhancement. Martynec battled Thunderbird and escaped after setting off an explosion that destroyed his laboratory. After overcoming his hesitations and agreeing to join the X-Men, Thunderbird was part of the team sent to the South Pacific to rescue the original team members from the living island Krakoa. After returning victorious, Thunderbird trained with the group, but it did not go well. 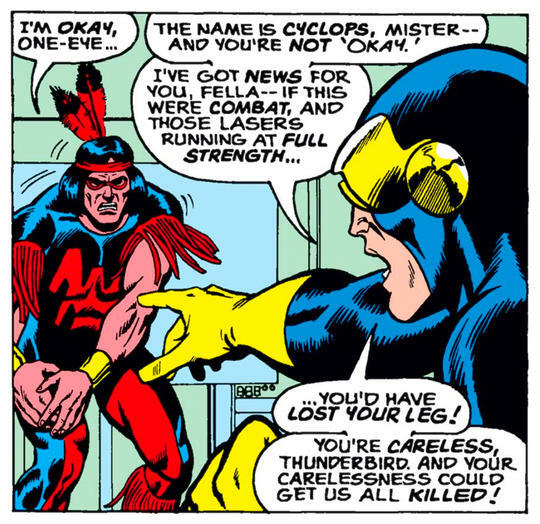 His overly-competitive and tense nature made for an ill-fit and his amped-up eagerness caused him to challenge Cyclops’ leadership and injure himself in the Danger Room. Because of this, Cyclops didn’t even want Thunderbird to be a part of the team’s next mission—but Thunderbird insisted. It would be Thunderbird’s last. 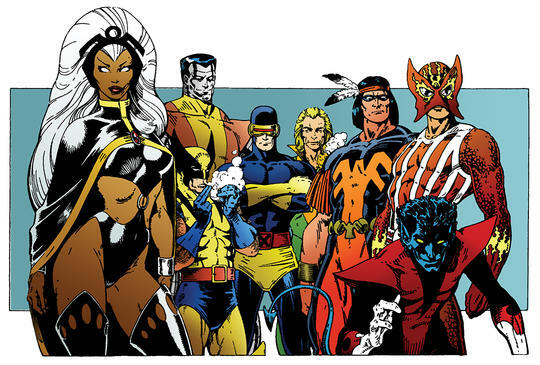 After Count Nefaria took control of the North American Air Defense command center at the Cheyenne Mountain in the Colorado Rockies, the X-Men raced in to save the day. When Nefaria escaped in a small plane, Thunderbird, ignoring warnings from both Banshee and Xavier, jumped on the plane as it took off. Determined to show that he was a true Apache warrior, Thunderbird began to smash on the aircraft with his fists. Nefaria managed to escape, but the plane exploded, killing Thunderbird. Much later, Thunderbird and his entire tribe were resurrected by Eli Bard using a techno-organic virus, in an attempt to offer them as undead servants to the immortal sorceress Selene as a token of his love. 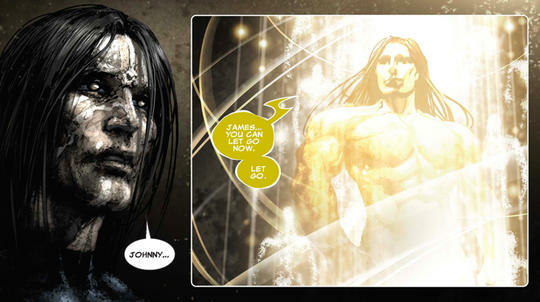 After fighting with his brother Warpath (James Proudstar), he died again, and his spirit was freed after the death of Selene. 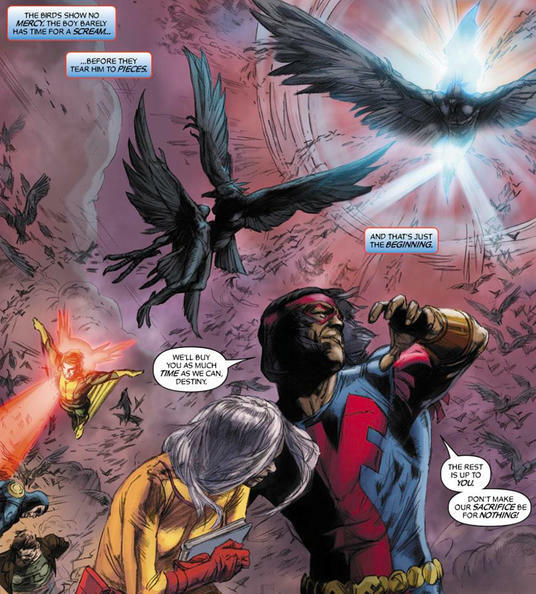 Thunderbird would be briefly resurrected yet again during the Chaos War, along with several other X-Men members and allies, this time fighting for a just cause against the Carrion Crow. After defeating the Carrion Crow, John Proudstar returned to his grave, feeling his life now meant something.